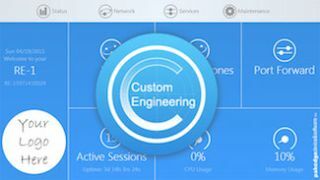 Pakedge Device and Software has announced the launch of the Pakedge Custom Engineering program. This program is the first of its kind in the industry, as it gives systems integrators the opportunity to embed their “tried-and-true” configurations into the router firmware itself. In addition, integrators can co-brand their logo into the router’s graphical unit interface (GUI) and onto the unit label. Pakedge's new customizable routers accelerate and automate network installations by ensuring that networks are instantly set to the integrator’s unique specifications on every project.In contrast to loading a preconfigured file, Pakedge Custom Engineering is far more robust, as it involves burning the configurations directly into the firmware. This means an integrator can still make configuration tweaks on a customized router, and can revert back to the customization by hitting the factory default button. These customized routers accelerate and automate network installations by ensuring that networks are instantly set to the integrator’s unique specifications on every project. Registered Pakedge dealers will be able to set custom configurations to suit their particular needs, whether commercial or residential, market segment, or application specific. The process for ordering customized routers occurs in two steps. First, an integrator will consult with Pakedge technicians and develop the customized firmware—a process that generally takes two to three weeks to complete. Once the firmware is ready and available for order, the integrator can choose how many units he or she would like to purchase. Pakedge Custom Engineering was developed to help integrators market their expertise and differentiate themselves in an increasingly crowded market, against consumer-grade equipment and other no-name commodity brands. “I like to prebuild and preconfigure racks before delivering them to the client and with Pakedge's new firmware, it makes plug and play even easier for my team," said Todd Puma, owner of The Source Home Theater and popular AV blogger. "Not all of them understand networking but they do all understand connections so now anyone can do it. Having a set firmware along with look and feel, will make closing projects quicker and easier. The Custom Engineering program is currently available on Pakedge RE-1 and RE-2 media routers only, but is expected to expand to other Pakedge network devices in the future. The upcoming WK-1, an 802.11ac wireless access point, will be the next Pakedge product in line for the custom firmware service.